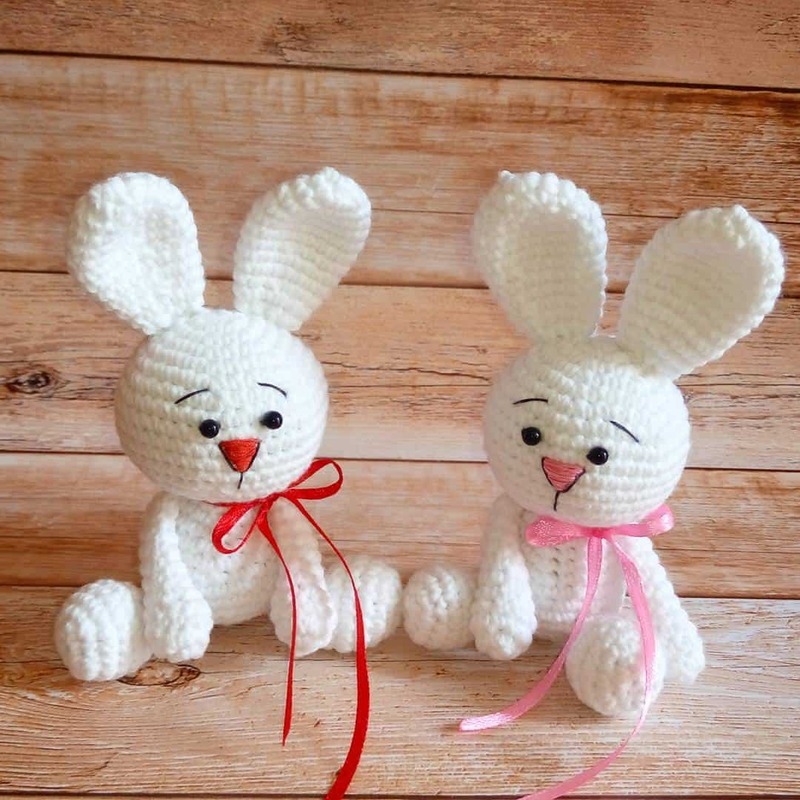 This easy White Rabbit Amigurumi Pattern is perfect for beginners. All parts are very simple. 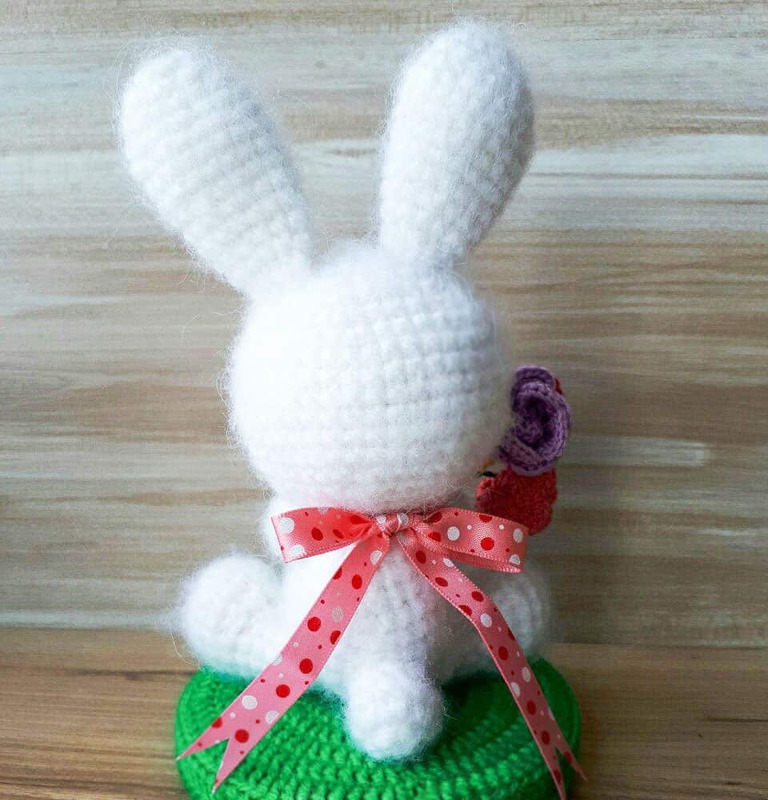 If you use baby (5 ply) yarn and 2.5 mm hook, your rabbit will be about 15-20 cm tall. Also, you will need stuffing, a pair of beads, sewing needle, ribbon and scissors. In case you have questions regarding the patten you can always write them in comments. Happy loops! Work in continuous rounds, stuff as you go. 5 ch, continue crocheting around the foundation chain, making an oval foot. Rnd 8-9: sc in all 9 st. Fold the in half and crochet through both layers to close the opening. Fasten off leaving a tail for sewing. Fold in half and crochet through both layers to close the opening. Fasten off leaving a tail for sewing. What row do you insert the safety eyes? 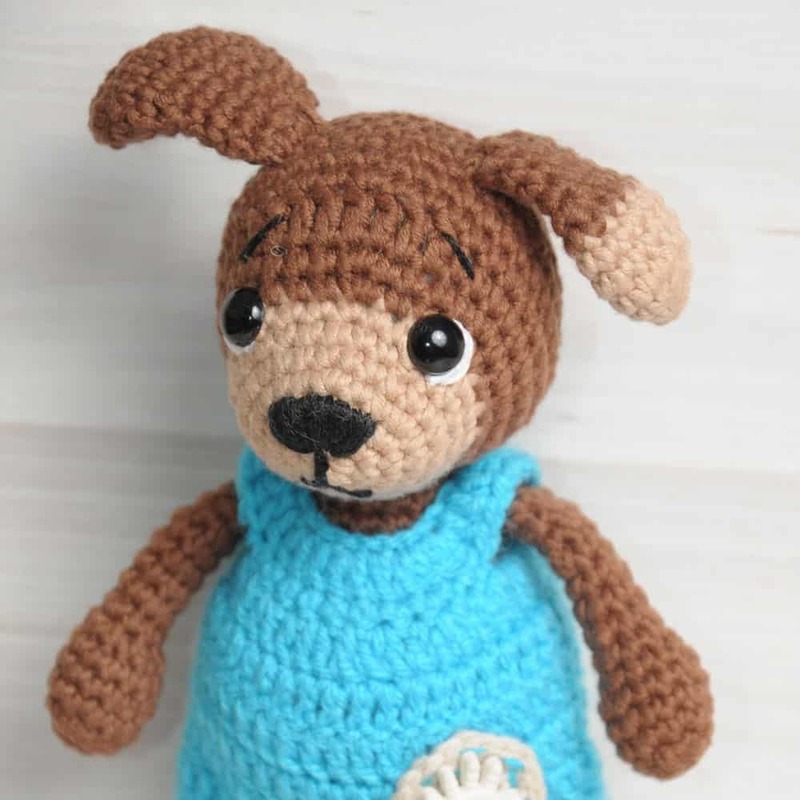 I want to know the website I can go to to find patterns for various things. Hi Pam! 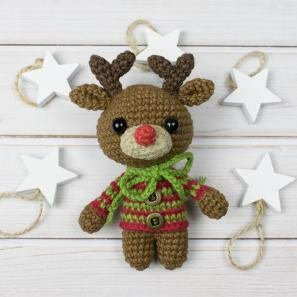 🙂 Perhaps, you crocheted the head not as tightly as other parts? This is a common cause of such effect. Thank you so much for the patterns.. Love them! Approximately how much yardage is used to make this pattern? When using a worsted yarn. How cute!!!!! Thanks for all your patterns. I’m new to amigurumi. I ve already done giraffe and sunny bunny and they are so cute. Now working on ballerina doll. But I’ll do this cutest bunny😍 now. Is there a pattern for that rose bouquet? 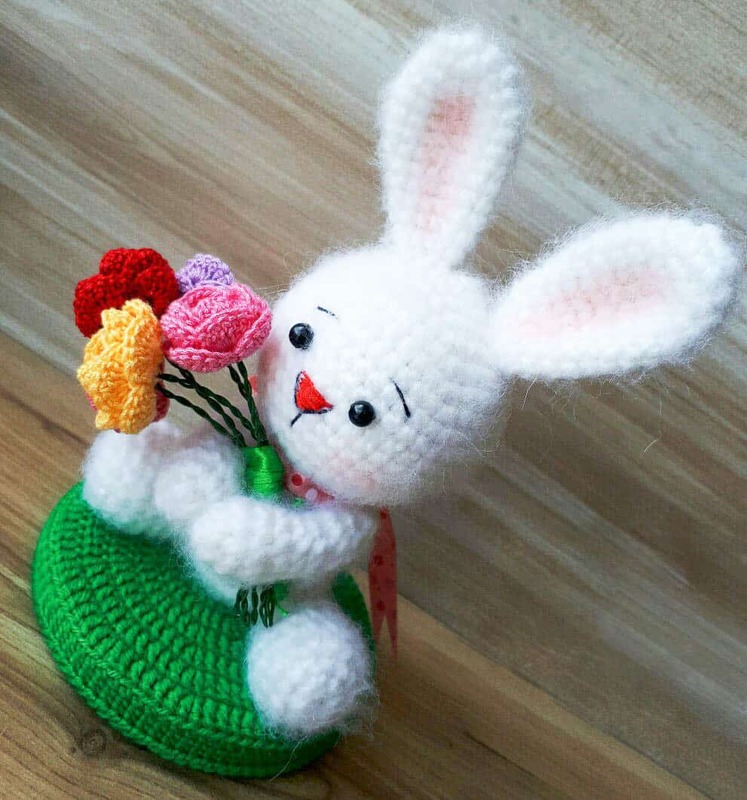 Of course, the rabbit can be assembled with plain white thread. On the legs: Do you only work on opposite side of chain in Rnd. 1 or in all the other rounds too. Hi Marcia, just work in a spiral after Rnd 1. So an inc is 2 sc in one stitch and a dec is crocheting 2 sc stitches together to create one stitch? Tweaked this pattern a little tiny bit to suit my needs, but its such a cute inspiration that very little needed to be changed. Thank you. When joining the head and the body how do the stitches line up as the head ends at 6sts and the body ends with 18sts…. Hi Katie! Sew the head along the body edge. This is 4ply semi-cotton yarn. 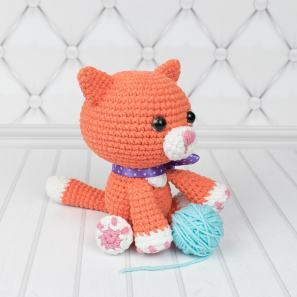 Adorable amigurumi! Can you tell me how large this bunny is? It’s about 15-20 cm. But note that the size can be different, it’s depends on yarn weight, hook and tightness of stitches. Can you tell what weight yarn you used and size hook? I tried it with a 4 ww but the holes seem to big. This is 5 ply yarn and 2.5 mm crochet hook. 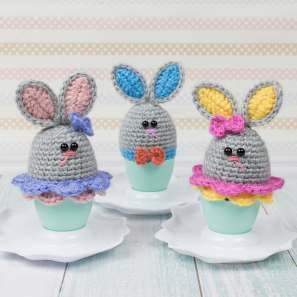 Luv all these patterns, they are soooooo cute. I was looking for a deer pattern, preferably a buck. Do you have one on your site? If so could you direct me with a link maybe. Hi Donna, it’s Yarnart Jeans semi-cotton yarn 1.76oz(50g) – 174 yds(160m). Thanks. 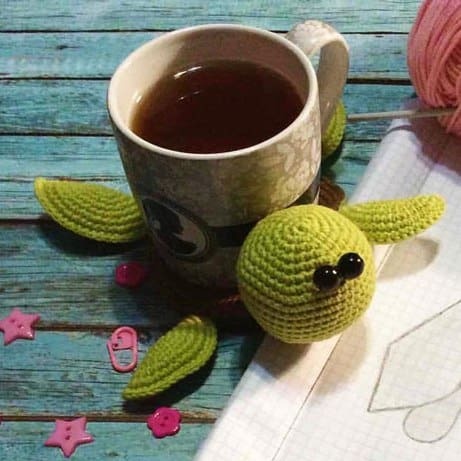 Is there a video tutorial for this pattern? Hi Sylvia, there is no video-tutorial at the moment. Hi Sylvia, after word “turn” you need to work on the opposite side of the chain. I got the same doubt!! I did 5ch, sc in next 3st, 3sc in last st, sc in next 2st and 2sc in last so I got 10 sc!